Weaferinteriors SG single glazed flush look head / abutment track has been designed to sleekly compliment the EVOLUTION partition system. Designed with single to double transition in mind, the head / abutment height marries into the flush look on the single glaze track alongside, single glaze and double glaze door frames from both inside and out-side the office environment, this gives a flush wall of glass look at the head. 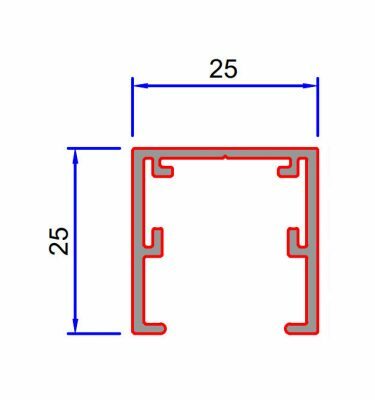 The product is supplied in extrusion length and comes complete with a choice of either clear or black PVC gasket clip in profiles. Lengths as standard are 3000mm, supplied in a standard Mill finish or RAL9010 white / 9006 silver / 9005 black or any other UK RAL or BS colour subject to paint set up conditions, SAA anodised finish is also available upon request. weaferinteriors SG – Single glazed flush look head / abutment track is part of an acoustic tested system providing a upto 38dB (Rw) when being used in conjunction with the stated door frame ( SGDF ) and base tracks ( SG01 & SG02 ) plus all the relevant component gaskets (SG03-PVC) glass clip in, (SG01-4/5BG) track base gasket and (SGDF-BLKG) door rebate gasket parts. Glass scenarios are 10 & 12mm toughened & 10.8mm laminated & 12.8mm with glass dry joints. See test evidence for more details. Weaferinteriors SG – Single glaze flush look head / abutment track, has x3 recess areas for cleat installations in straight runs or when corner/mitre and 135 degree details are to be used. Fitting of the track securely requires all cleats to be ixed firmly to give a seamless joint between runs of track work, Glass insulation requires head / abutment gaskets to be lubricated prior to fitting panels, (particularly on 12/12.8mm glass as these are a tighter fit). This system is currently not fire rated.